Mary Akers has been writing and publishing since 1995. Her fiction, poetry and non-fiction have appeared in a number of international journals and magazines, and her personal essays on parenting and the writing life are forthcoming in various anthologies. She frequently writes fiction that focuses on the intersections between art and science, including such topics as diverse and timely as the environmental movement and the struggle for human rights. She is a co-founder of the Institute for Tropical Marine Ecology, a study abroad marine ecology program located in Roseau, Dominica and in her spare time she enjoys snorkelling, hiking, backpacking, mountaineering, canoeing and snowshoeing. Among other jobs, she has worked as an historical interpreter/bookbinder in Colonial Williamsburg, as a production potter at Historic Jamestown Island, as a self-employed functional potter, an art teacher, a fabric seller, and a food server in a nursing home. Although raised in the Blue Ridge Mountains of Virginia—which she will always call home—she currently lives in Western New York with her husband and three children. 1. 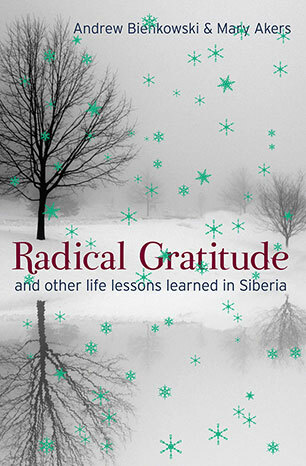 What did you enjoy most about writing Radical Gratitude? I think I most enjoyed getting to know Andy’s family. Granted, they have all been dead for many years, but hearing all of his stories, and having to write about his family in such an intimate way really brought them to life for me. His grandfather stubbornly starved to death in order to leave enough food to keep the children from starving. His educated, refined mother braved tending the village cows that terrified her because she was paid one loaf of bread a week to do so. Too old to work, his grandmother took up fortune telling as a way to bring in scraps of food to feed her family. Andy went into the empty fields and picked up one grain of wheat at a time after the harvesters had left, sometimes spending all day obtaining a single small cup of wheat. Even his three-year-old brother smuggled pieces of bread home from the communist school to share with his starving family. They pulled together and never lost hope, and they survived what many others didn’t. They even escaped Siberia. Writing his story was also very educational for me. I learned a great deal about that period in history. It was such a pivotal time for the planet, the time of World War II. And writing Andy’s story allowed me some small access to this incredible experience of his. 2. What was the hardest part of writing the book? I think the most difficult thing was the organizing of Andy’s family stories and then matching them up with life lessons in a way that made for a logical flow of information and also an interesting and intriguing storyline. I think we ultimately succeeded. 3. What was the most meaningful part of the book for you? The lessons on hope and perseverance meant the most to me. I believe in never giving up, in staying positive and getting back up each time you are knocked down. It’s the only way to ultimately get what you most want in life. Not only does Andy’s family’s story of survival exemplify this, the book’s very publication does, as well. Our wonderful agent, Isobel Dixon was the first one to believe in this book, and we are forever grateful to her for that, and also for matching us up with Maggie Hamilton our extraordinary editor at Allen & Unwin. It feels like the perfect home for this book. 4. How long did it take for the book to be completed? My records show that I first officially started writing the book on May 1st of 2005, so almost three years, start to finish. As most books do, it went through many different versions before we hit upon its final version that alternates the survival stories from Siberia with the life lessons Andrew learned during that harrowing time. 5. How did you and Andy meet? A mutual friend Joy Herrick introduced us. Joy is a wonderful writer herself, but after hearing Andy’s story, and about his struggles to write the book himself, she thought of me and asked me if I would be interested in helping him to write his book. It sounded fascinating, so I agreed to meet him and Joy brought him by my house. We hit it off immediately and have been good friends and productive co-workers ever since. 6. How do you think Radical Gratitude will help others? It will inspire them to think in terms of the big-picture things in life - the things that we often take for granted, like persistence, faith, hope, love, and the importance of gratitude, even for the difficult things that happen to us. Also, the book has been written in such a way that it can be inspirational to anyone - anyone can relate to Andy’s family and their story of survival. The case histories cited from his years of clinical practice are examples of the struggles that everyone faces. And the many timeless and inspiring quotations bring the book alive with a universal wisdom that speaks to everyone. 7. What is radical gratitude? Radical Gratitude is the notion that we can learn to be grateful even for the difficult things that happen to us in our lives because they teach us how to be better human beings. It’s a version of the old adage, "That which does not kill us makes us stronger." When we embrace the idea of radical gratitude, we can learn to look back at the difficult experiences in our lives and see how they have transformed us - made us smarter, more resilient, more empathetic toward the suffering of others. Radical Gratitude also gives us hope during the darkest times - hope that we will someday be able to look back and realize what we have learned, that we will ultimately gain from our present pain. The grace lies in the lessons that the struggle imparts. 8. What makes one man's lessons from almost seventy years ago applicable today? Stories of survival and the human condition are timeless. 300 years ago, or last week, it doesn’t really matter when you are speaking about human suffering and the overcoming of it. But in general, I think stories of sacrifice, hope, and family appeal to everyone. We can all benefit from hearing true-life stories of persistence, faith, and gratitude that ultimately win out over adversity. 9. Andy was only five when he was sent to Siberia. How did he remember all of this? That's a great question, and one I struggled with during the writing of this book. Obviously his memories would be scanty. How much does any one of us remember about the years before we turned eight? Probably we only remember bits and pieces, if anything at all. But every family has its storyteller, and Andy's grandmother was theirs. Babcia kept the stories from Siberia alive - telling and retelling them - so that they would not be forgotten, so that her children would remember their mother after her early death, so that the sacrifices of their grandfather would not be forgotten, and so they would understand the evils that can be set upon ordinary, innocent people when governments get too much power. So, these stories from Siberia are a combination of the stories that Babcia told and retold over the years as Andy grew up (as he relayed them to me), and they are re-imagined stories of his own childhood events that he has been able to recall, and they are my attempts to understand, respect and accurately portray the members of his family and all that they endured. An illuminating melding of narrative and inspiring practical guidance, this is both the extraordinary true story of a family's survival in Stalinist Siberia and a guide to becoming a person who can give to others.